Microsoft's work on "bendable or flexible" display technology is far more advanced than anyone realised. A new patent application from Redmond indicates it's inspired by a very familiar technology: the paperback book. Of the two claims, one (Application 2018/0113520, PDF, "Input based on interactions with a Physical Hinge") follows the now-familiar, Courier-style dual touchscreen format as the embodiment of the invention – but the other is far more interesting. This (Application 2018/00113241, PDF, "Curved edge display with controlled luminance") describes techniques for display content on folding images. The hypothetical device pictured contains two flexible displays hinged, like a paperback book. One of the latest applications to surface (no pun intended) are far more interesting, showing an implementation of a dual-folding "bendable or flexible" OLED matrix. The IP that Microsoft seeks to protect recognises that flexible displays distort the image presented to the user – it's difficult to present a uniform brightness. So the invention seeks to ameliorate the distortion. 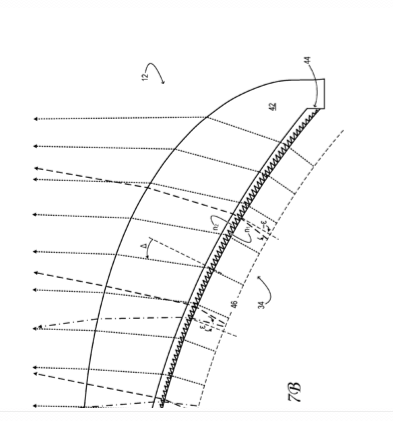 "A prismatic or holographic film" may also be used, the patent application notes. Earlier patents indicated that Microsoft continued to toy with a dual touchscreen pocket companion, much like the ill-fated Courier. This project emerged in 2009 as Apple prepared to launch its iPad. Courier was being developed by J Allard, who had led the Xbox team, but fell victim to the usual internecine warfare at Microsoft, and Allard left the following year. Work continues on a more conventional dual touchscreen design.